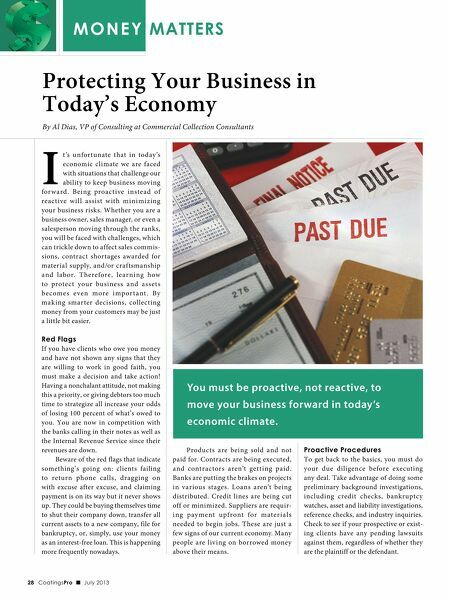 M o n e y Matters Protecting Your Business in Today's Economy By Al Dias, VP of Consulting at Commercial Collection Consultants I t's unfortunate that in today's economic climate we are faced with situations that challenge our ability to keep business moving for ward. Being proactive instead of reactive will assist with minimizing your business risks. Whether you are a business owner, sales manager, or even a salesperson moving through the ranks, you will be faced with challenges, which can trickle down to affect sales commissions, contract shortages awarded for material supply, and/or craftsmanship and labor. Therefore, learning how to protect your business and assets becomes even more i mpor ta nt. By making smarter decisions, collecting money from your customers may be just a little bit easier. Red Flags If you have clients who owe you money and have not shown any signs that they are willing to work in good faith, you must make a decision and take action! Having a nonchalant attitude, not making this a priority, or giving debtors too much time to strategize all increase your odds of losing 100 percent of what's owed to you. You are now in competition with the banks calling in their notes as well as the Internal Revenue Service since their revenues are down. Beware of the red flags that indicate something's going on: clients failing to return phone calls, dragging on with excuse after excuse, and claiming payment is on its way but it never shows up. They could be buying themselves time to shut their company down, transfer all current assets to a new company, file for bankruptcy, or, simply, use your money as an interest-free loan. This is happening more frequently nowadays. 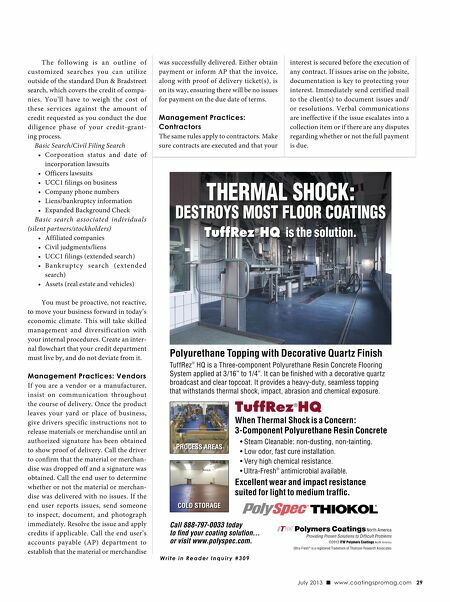 28 CoatingsPro g July 2013 You must be proactive, not reactive, to move your business forward in today's economic climate. Products are being sold and not paid for. Contracts are being executed, and contractors aren't getting paid. Banks are putting the brakes on projects in various stages. Loans aren't being distributed. Credit lines are being cut off or minimized. Suppliers are requiri ng pay ment upf ront for materia ls needed to begin jobs. These are just a few signs of our current economy. Many people are living on borrowed money above their means. Proactive Procedures To get back to the basics, you must do your due diligence before executing any deal. Take advantage of doing some preliminary background investigations, including credit checks, bankruptcy watches, asset and liability investigations, reference checks, and industry inquiries. Check to see if your prospective or existing clients have any pending lawsuits against them, regardless of whether they are the plaintiff or the defendant.